Juliet, Naked is a new indie dramady from director Jesse Peretz and is based on a novel from Nick Hornby. 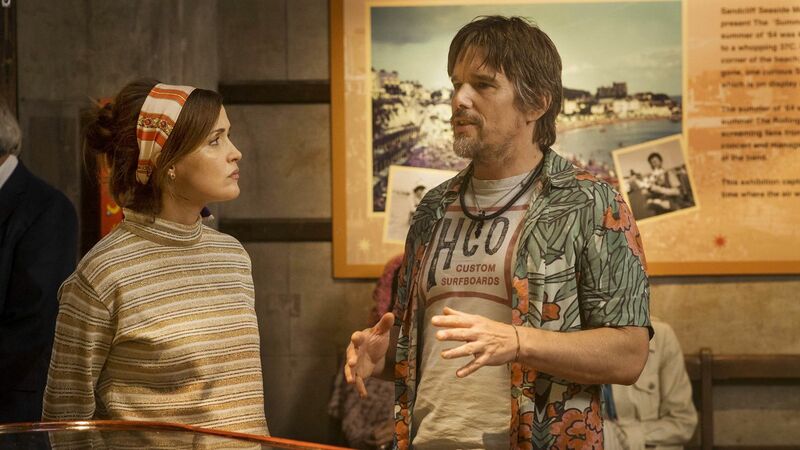 The story revolves around an English museum curator named Annie (Rose Byrne) who is in a tumultuous romantic relationship with a man named Duncan (Chris O’Dowd) who is obsessed with a long-disappeared American rock musician named Tucker Crowe (Ethan Hawke). Duncan receives a demo copy of Tucker’s last album Juliet, Naked, which Annie listens to and writes a scathing review of on a blog dedicated to Tucker Crowe that Duncan runs. One of the few people that agrees with Annie’s review is in fact Crowe himself leading the two to eventually meet. As with most movies I saw this summer, I did not know much about Juliet, Naked going in and that does not make a difference because this movie is incredibly forgettable. On a technical level, Juliet, Naked is not all that special. The direction, cinematography, and editing are not bad, but they are not memorable either. There was one shot I liked where the camera was following Rose Byrne’s face as she is walking but that’s it. Music on the other hand is the one technical area in this movie that impressed me the most. With the help of several talented songwriters, Ethan Hawke lends his vocals to the original songs in the movie which goes to show how talented he is. The performances in Juliet, Naked are where it truly shines. Rose Byrne continues to make me believe that she is British even though she is actually Australian. Otherwise, her character is nothing she has not played before and it’s a character that has been in other romantic comedies. Chris O’Dowd is sometimes funny as this obsessive fan, but he is not too interesting either. The true standout here is Ethan Hawke who is believable as this faded rock star who has let his past life get the best of him. In fact, his dynamic with Rose Byrne’s character is one of the highlights of this movie because one has not lived her life enough while the other has lived his life too much. One of the screenwriters for this movie, Jim Taylor, is an Oscar winner yet this screenplay is so full of clichés. For example, Annie wants to have kids while Duncan does not. Fortunately, the movie becomes more interesting when Annie and Tucker first meet. There are some nice messages about how art is subjective, but they are barely addressed. Speaking of “barely addressed,” I was not satisfied with the ending as it left me wanting more and not in a good way. There is not much left to say about Juliet, Naked. Outside of a great performance from Ethan Hawke, it is a fairly forgettable dramedy that is not worth seeing in theaters. Wait until it is available to rent.